For some reason, you may prefer 2-ways radio conversation for frequent and brief voice conversation under certain situation. Without spending extra money for a new pair of RF based walkie-talkies, there are some apps available that can tranform your iPhone to a network based walkie talkie for such purpose. While most of them are not free and required minimum charge when you purchase from iTunes store, but there are also a number of free apps as listed below that worth trying out. Being developed by Circle Apps LLC, iPTT, is a simple but yet useful push-to-talk app that can connect you to certain parties that have similar apps installed on their iPhones. Basically it consists of two modes namely public and whisper mode. As it is self-explanatory, your conversation will be heard by all users when in public mode but can be switched to whisper mode for more privacy communication. Its GUI is pretty simple with only a single PTT button at the main screen for half duplex communication, and at the same time users can tune into different ‘channel’ ranging from 0-20 (in 0.1 incremental value) just in case certain channels are too congested with many users. Walkie Talkie – wifi by Porchlight is even simpler apps that can be installed on different iPhones/iPods devices for two-way communication. Its audio level is relatively high with better clarify but still there are some limitations. The apps can support up to two iPhone/iPod devices only and worst still, both have to be stayed at the same WiFi network to enjoy such usage. However, it doesn’t lose its usefulness especially suitable for those that would like to communicate at short distance. For instance, from living room to master room upstairs or etc. Good thing is, Walkie Talkie – wifi app can always keep both iPhone/iPod devices stay connected regardless if they are in standby mode for efficient battery power management. Dubbed as the world’s first Live Messaging application, Voxer Lite by RebelVox is so far one of the most comprehensive and powerful Live push-to-talk apps suitable for all. 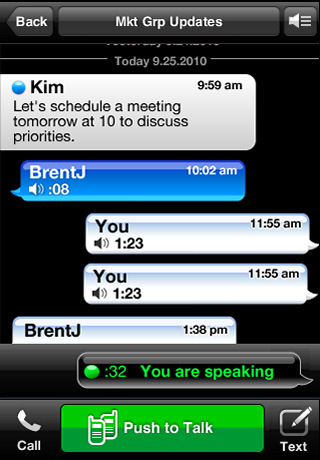 Besides available in voice conversation, users can also type text and send the audio which can then be retrieved and tracked by recipients with each thread well sorted by time and user groups. Even though its Push-to-talk doesn’t seems to trigger voice transmission as immediate as iPTT and Walkie Talkie wifi apps, but users can enjoy additional full duplex voice conversation by calling their contact lists just like when they are talking on normal mobile phone. On top of these, it simplifies the new account sign up effort as they can use Facebook account to login and start searching for new contacts right away. Depending on how you actually want to use them and for what purpose, you may want to try each of them since all are free of charge before deciding on the best one that fits your usage.